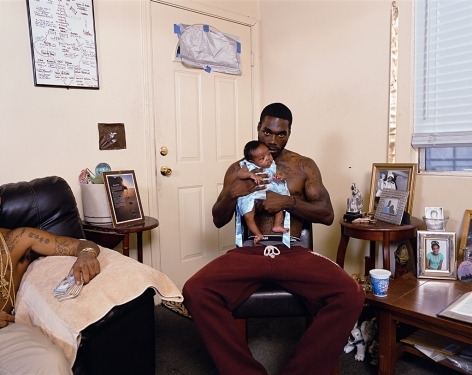 Deana Lawson is a photo-based artist born in Rochester, NY. She received her M.F.A. in Photography from RISD in 2004. 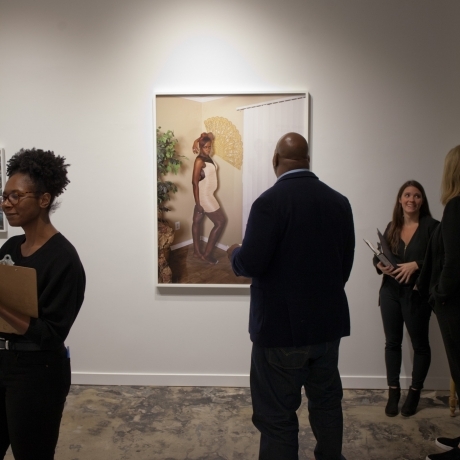 Her work examines the body’s ability to channel personal and social histories, addressing themes of familial legacy, community, desire, and religious-spiritual aesthetics. Her practice borrows from simultaneous visual traditions, ranging from photographic and figurative portraiture, social documentary aesthetics, and vernacular family album photographs. 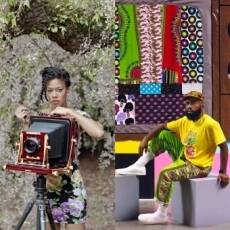 Lawson is visually inspired by the materiality of black culture and its expression as seen through the body and in domestic environments. 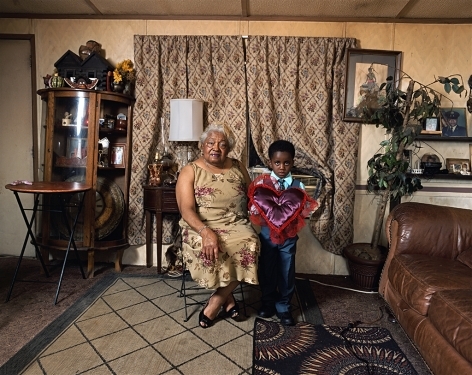 Lace curtains, artificial nails, blemished skin, colored weave, and plastic couch covers are examples of visual material that Lawson identifies and heightens in her pictures. Careful attention is given to lighting and pose, both formal constructs used to transform, inform and intensify representations of power and liberation through the personal and intimate space. 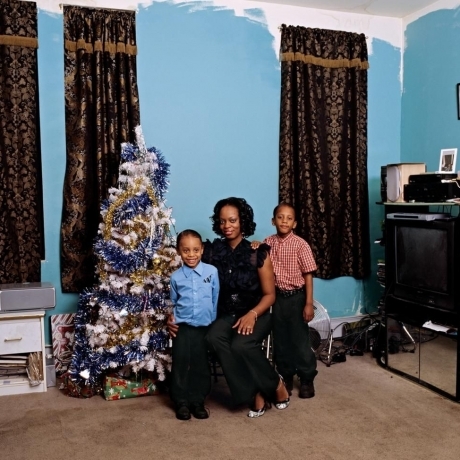 Lawson meets her subjects in everyday walks of life: grocery stores, subway trains, busy avenues in Bedstuy, Brooklyn, and road trips taken to the American south. 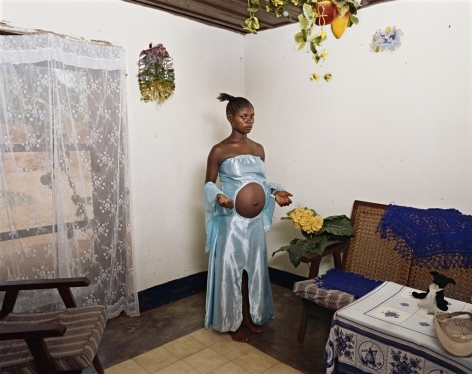 Lawson received the prestigious Guggenheim Fellowship in 2013, which gave her the opportunity photograph internationally. 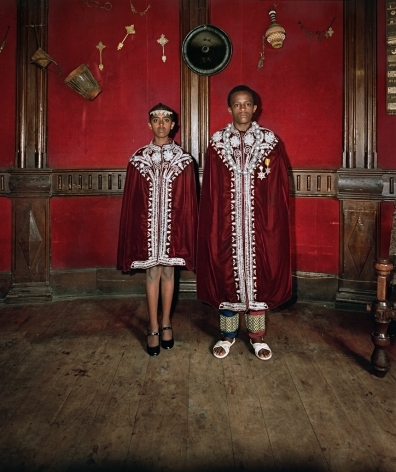 She has photographed in DR Congo, Haiti, Jamaica, Ethiopia, and most recently South Africa. 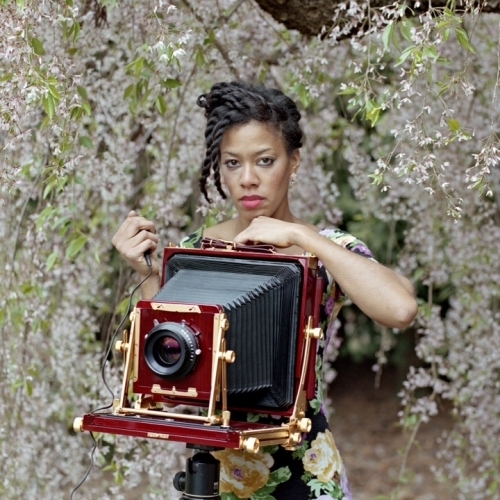 Her work has been published in ArtForum, TIME Magazine, The New Yorker, and Aperture. Lawson was included in the 2017 Whitney Biennial and currently has work on view at Carnegie Museum in Pittsburgh, PA. Lawson is currently an Assistant Professor in Photography at Princeton University. Exhibitions include Whitney Museum of American Art, Contemporary Art Museum, St. Louis, Malmö Konsthall Museum, Museum of Modern Art, Art Institute of Chicago Museum, Institute of Contemporary Art in Philadelphia, Brooklyn Museum of Art, P.S.1 Contemporary Art Center in New York, Helene Bailly Gallery in Paris, Studio Museum in Harlem, KIT Museum in Dusseldorf Germany, Light Work Gallery in Syracuse New York, Cohan & Leslie Gallery in New York, Collette Blanchard Gallery in New York, Artists Space in New York, Print Center in Philadelphia, and Spelman College Museum of Fine Art in Atlanta. 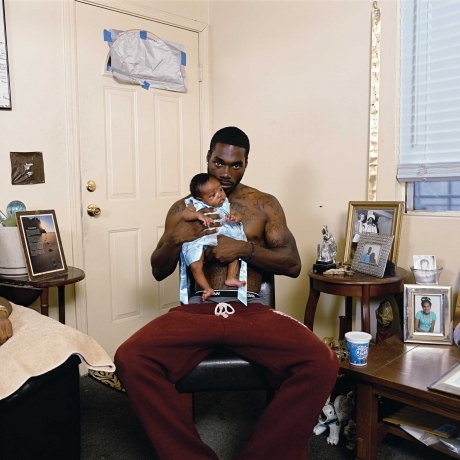 Lawson is the recipient of the Guggenheim Fellowship, Art Matters Grant, John Gutmann Photography Fellowship, Rema Hort Mann Foundation Grant, Aaron Siskind Fellowship Grant, and a NYFA Grant in 2006. Her work has been published in ArtForum, TIME Magazine, The New Yorker, Aperture, California Sunday Magazine, The Collector's Guide to New Art Photography Vol. 2, Time Out New York, Contact Sheet #154, and PQ Journal for Contemporary Photography Volume 24. Deana has participated in residencies including: 2010 Workspace Residency at Lower Manhattan Cultural Council in New York, Light Work in Syracuse, NY, and Visual Studies Workshop in Rochester, NY.